Found By Simran Virdi (B.Sc. (Hons) Biomedical Science. Discovery Notes Isolated from a soil sample procured from Hauz Khaas, New Delhi in a state called Delhi. 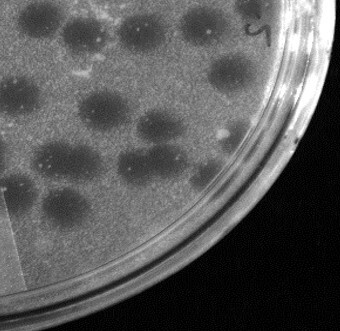 The protocol followed for isolation of the Mycobacteriophages was as described in the manual "Phagehunting Teacher Workshop-2012". The work was carried out in Dr.Urmi Bajpai's laboratary at department of Biomedical Science, Acharya Narendra Dev College, University of Delhi under the PHAGE DISCOVERY Research Project (PDRP). Plaque Notes Clear circular of diameter 0.5cm at 48hrs. At 72hrs, the clear zone remains as it is but the periphery of the plaque expands to give a turbid appearance, similar to a halo. After 96 hours final plaque size (including the turbid zone) is 5 cm.